New intercity trains planned for NSW could come equipped with Wi-Fi and bike storage, NSW Transport Minister Andrew Constance has said. The NSW government is spending $2.8 billion to create the new intercity fleet, which will link Sydney with areas such as the Blue Mountains, the South Coast, the Central Coast and Newcastle. There will be 65 trains and 520 carriages in all, with the first due to be delivered by 2019 and the rest being delivered through to 2024. New intercity trains planned for NSW could come equipped with Wi-Fi and bike storage, NSW Transport Minister Andrew Constance has said. The cost of replacing NSW's intercity train fleet has blown out by $1.1 billion partly because the "off-the-shelf" trains the Baird government hoped to buy will need modifications to do the job. Less than 18 months after then transport minister Gladys Berejiklian unveiled plans to buy 65 new intercity trains and about 520 carriages, the cost of the project has risen to $3.9 billion from $2.8 billion. The new trains are needed to service the Blue Mountains, the Illawarra, Newcastle and the Central Coast. When she announced the order in May last year, Ms Berejiklian said the best way to avoid past delays was to buy the trains "off-the-shelf with proven technology from the world's best". In the past, trains such as the Waratah were designed specifically to suit conditions in NSW. But it has emerged that the trains the government initially planned to order would be able to run only on intercity lines because they would be too long and narrow for underground platforms on Sydney's suburban network, which are usually about 170 metres long. In contrast, platforms at regional stations are about 200 metres. Existing trains in the state's fleet such as the Tangara G-sets and Oscars are suited for several roles. They can run on inner-city lines to underground stations such as Wynyard, Town Hall and Martin Place, as well as plying outer suburban lines to Wollongong, Springwood in the Blue Mountains and Newcastle. At present, almost a quarter of the trains that run on the suburban network during peak travel hours are tagged "regional rolling stock", helping transport officials to maximise their use and plug any gaps. "The mistake they made is that they wanted a single-specification train to operate on the regional intercity services and have overlooked that such a train set would be incompatible with the inner suburban underground network," an insider said. Transport for NSW has blamed "operational and network changes", the inclusion of a new maintenance facility and currency fluctuations for the $1.1 billion surge in the project's cost. A $2.3 billion contract to build an inter-city train fleet for New South Wales has been awarded to a company offshore. The new trains will run between Sydney and Newcastle, the Central Coast, South Coast and the Blue Mountains. The State Government has awarded the contract to the RailConnect Consortium, which will build 500 double-decker carriages in South Korea. Transport Minister Andrew Constance has defended sending manufacturing offshore, saying the winning bid offered the best value for money. "In this case the procurement stacks up, it's a 25 per cent saving by going with this consortium," Mr Constance said. "If I didn't go with this winning bid you'd be criticising me the other way. "Of course everyone is pro-Australian manufacturing and jobs but at the same time you've got to weigh it up, in terms of cost and in terms of technology." 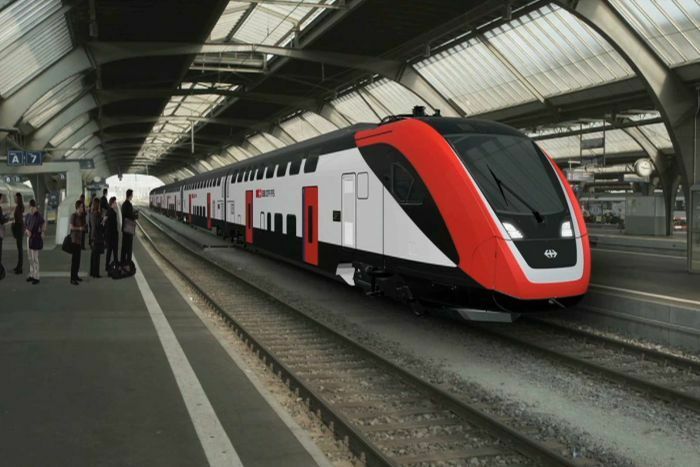 Hundreds of new train carriages for NSW's intercity fleet will be built in South Korea after the Baird government awarded a $2.3 billion contract to a UGL-led consortium, dashing hopes that they would be assembled in Wollongong. The jobs of scores of train guards on NSW's intercity rail fleet are under threat from the purchase of new trains from South Korea that can be operated solely by drivers. The proposal to shed guards highlights an increasing automation of the state's train network, a trend that will intensify when the first driverless metro trains begin running between Sydney's north-west and Chatswood in 2019. That same year, the first of more than 500 double-deck train carriages from Korea for the intercity fleet will begin to replace the decades-old V-set trains that run from Sydney's Central Station to the Blue Mountains, Newcastle, and the Illawarra. Tender documents for the new fleet for NSW TrainsLink show one of the requirements for each train is that it "must support driver-only operation". Drivers will be "responsible for monitoring the train-platform interface using the CCTV system, responding to passenger intercoms, passenger information and passenger assistance". The Rail, Tram and Bus Union fears the jobs of up to 300 of the 380 guards employed on NSW's intercity network are at risk from the proposal. The union's state secretary, Alex Claassens​, said the removal of guards would raise serious concerns because they performed a multitude of safety roles, especially on curved platforms at stations where drivers could not see the full length of trains. "There is no doubt [the government] want it – the minister has made his position quite clear. But there is no way they can operate that [new] train safely in the current network configuration they have today [without guards]," he said. Mr Claassens said it was possible for driverless trains to operate safely on the new metro line under construction in Sydney because barriers such as screens on platforms would prevent the public from gaining access to the railway line. However, he said billions of dollars would need to be spent to bring the existing railway network up to a standard that allowed trains to operate safely without guards. "Every day there is an emergency on the network, whether there is flooding ... or a fatality. I have been working on the railway since 1977, I am a qualified driver, and I can't see how you can do this safely, unless you spend lots and lots of money," he said. "It is just dinky toy stuff." TrainsLink said a driver-only option for the new trains would be introduced only "where it is safe and appropriate to do so". "Under a driver-only proposal, guards would have continued employment until the new intercity fleet is progressively introduced from 2019. Even then we would still need guards on our current diesel fleet," it said. The government-run operator said it had been meeting staff representatives "well in advance of 2019 so all options can be explored". Retraining and redeployment within the state's train network would be available to guards, and TrainsLink would work with them to "better understand their individual career intentions". TrainsLink said a driver-only operation would not be unique to NSW as it had been in place for many years in Melbourne and Perth, as well as on railways overseas. However, Blue Mountains Labor MP Trish Doyle described the proposal as appalling because train guards performed key safety roles at platforms, between stations and in emergencies. "There are significant and systematic problems with anti-social behaviour, passenger safety and comfort on our trains right now that will be made worse with the abolition of train guards," she said. The proposal to reduce train guards is also likely to emerge as a key point of contention in labour negotiations next year when enterprise agreements covering thousands of staff across Sydney Trains and TrainsLink expire. When the government awarded the contract for the new intercity trains last month, TrainsLink chief executive Rob Mason emphasised that they would have automatic door settings to ensure passengers could not exit carriages when they were not alongside platforms. The 512 new carriages will be delivered over three years from 2019. This represents a massive 50% leap in efficiency! You can have DOO and curved platforms. Yes. This would leave Brisbane as the sole operator with two staff per train. The only lines where DOO can actually be implemented in the short-medium term in SEQ would be the Airport - Gold Coast corridor (High Level Platforms and/or attended stations for the vast majority of the corridor). Sydney Trains will still have guards. DOO isn't the be all and end all. There are very good reasons why the vast majority of suburban/heavy rail railways around the world still have a guard or conductor in some way shape or form. THE deputy premier of the Australian state of New South Wales Mr Troy Grant and minister for transport Mr Andrew Constance announced on October 28 that the state government has allocated $A 50m ($US 37.9m) to accelerate the renewal of NSW TrainLink’s medium-and long-distance diesel fleet, starting with the XPT trains. The procurement of new trains to supersede the fleet of 19 XPT power cars and 60 intermediate trailers will now begin in the first half of 2017, two years earlier than previously envisaged. “We want this to be a great outcome and for that to happen, we need to start talking to the industry about the options available and how we get new trains on the track quickly,” says Constance. A development of the British High Speed Train, the XPTs were built by Comeng and ABB and entered service from 1982 onwards. The fleet still covers around 3.5 million-km annually, carrying around 1 million passengers a year on long-distance services from Sydney to Melbourne, Brisbane, and Dubbo. In addition to the replacement of the XPTs, the state government says it will look at options for new trains to supersede the fleet of 51 Endeavour and Xplorer DMU cars built by ABB in the 1990s. THE NSW Government has an embarrassing problem with $2 billion worth of new trains that are on order — they’re too wide to go through the tunnels. Whereas the current trains are 2.9m wide, the new models being built in South Korea are 20cm wider. That small difference could have a big impact. In addition, the tunnels would also be “notched” in places. This involves gouging a chunk out of the existing tunnel where the clearance is narrowest to allow the new trains the pass through. This gouge could be almost 13cm deep, much of which will take place on curves where trains are more prone to swaying. Around a third of the total length of the tunnels will have to be modified in a process that could take two years and will involve parts of the line to be closed for periods. Labor has said the admission that 10 tunnels will have to be modified because the new trains are too wide is an embarrassment for Transport Minister Andrew Constance. He has had a torrid few months with a new timetable causing chaos, bruising encounters with unions and the Ferry McFerryface debacle over the botched naming of a new boat. “Andrew Constance’s ministerial performance is a joke, but this latest bungle is no laughing matter,” said Mr Foley. Mr Foley said the Government should reveal the cost of the work needed to modify the tunnels and whether trains will have to slow down to get through them. The cost of the tunnel modifications will be in addition to the $2.3 billion cost of the new trains. TfNSW would not reveal to news.com.au the cost of the works. Nor did it deny trains might have to slow down when entering the tunnels. “We always knew work would be necessary to deliver new trains for Intercity customers on physically constrained parts of the rail network,” a spokesman said. In Fairfax Media, Mr Constance was quoted as saying parts of the Blue Mountains route were 150 years old and needed an upgrade. “I can’t understand why Luke Foley and the Labor Party don’t want a modern track and train upgrade for the people of the Blue Mountains,” he said. In its report, TfNSW said the more modern tracks used on the line means trains are “typically more stable” so should tilt less. The Government body said notching wasn’t new, and the tunnels had to be modified in the 1970s to accommodate the V-sets which were wider than the trains they replaced. They are the seat of choice for NSW train passengers. But the top transport bureaucrats opted for the opposite to reversible seats for the state's fleet of new intercity trains the state government is buying for $2.3 billion. Now internal documents released under freedom of information laws show why the state's lead transport agency chose fixed seats for the new intercity trains despite its own research revealing “a strong customer appeal and usage of reversible seating” and a perception that fixed seating was a “backward step”. While passengers had a “general preference for flip seats”, a “sensitive” briefing document for Transport Minister Andrew Constance several months before he awarded the contract for the new trains in 2016 said there “is no proven design solution that meets safety requirements”. And that lack of design would place the timeline for the delivery of the new trains “at risk”. The two-by-two fixed seats to be installed in the 512 double-deck carriages being manufactured in South Korea mean about half of passengers will be facing backwards when they travel on them. A technical paper for the agency said reversible seats were popular among passengers but found them to be more complex, heavier and requiring greater maintenance than fixed seats. Flip seats were also more susceptible to damage and vandalism due to their moving parts, and posed a greater fire risk because they comprised more combustible materials. The documents show the overseas manufacturers bidding for the intercity train contract believed it would increase the cost of seating in the new carriages and reduce their seating capacity, resulting in more passengers standing. In recommending fixed seats be installed, transport officials warned that “careful consideration must be given” to the communication strategy for the arrival of the new trains to “ensure customer expectations are managed, given the strength of preference for reversible seating”. As it turned out, the government highlighted how the ‘‘trains will be more spacious, more comfortable and have features never before seen on our long-distance services’’ when it awarded the $2.3 billion contract to a UGL-led consortium in August 2016. Kevin Eadie, from community group Action for Public Transport, said fixed seating had been installed in trains such as the XPTs and Endeavours before transport officials bowed to pressure and installed reversible seats on them. ‘‘Reversible seating would be dearer but the question is whether Transport for NSW is interested in providing what people in NSW want,’’ he said. And Mr Eadie, who used freedom of information laws to gain access to the documents, said the decision could prove more costly in the long term if the fixed seats in the new intercity carriages were later replaced by reversible ones favoured by the state's train passengers. While the final layout was still subject to detailed design work, Transport for NSW said it would be similar to the state's Tangara trains which had half the seats facing in one direction and the rest in the other. Two sets of seats would also be placed at either end of each carriage which would allow passengers travelling in groups to face each other. The transport agency said the new intercity trains had been designed with passenger comfort in mind. “We've asked customers what they value and incorporated much of this feedback into the design, including two-by-two seating with wider seats, arm rests and wider aisles, as well as amenities like tray tables and charging outlets for mobile devices,” a spokesman said. But Labor's transport spokeswoman, Jodi McKay, said travelling backwards was “just not an option” for passengers who suffered motion sickness. Flip seats are commonplace on NSW's double-deck trains such as the Waratah and V-Sets. But NSW stands in contrast to railways in other parts of the world such as Europe, North America and Japan where fixed seating on trains is the norm. The first of the new trains will begin services late next year to the Central Coast and Newcastle. The government expects the new trains to begin running on the Blue Mountains Line to Mount Victoria in mid-2020, followed by Lithgow about four months later. After that, the trains will start carrying passengers on the South Coast Line to Wollongong and Kiama. Photo: Blue Mountains platforms are too narrow and too low to accommodate the new inter-city fleet of trains. When you find a cheap pair of fashionable shoes there is a sense of accomplishment, because you have found a bargain. Months later when they fall apart and you are forced to spend more money in repairs or buying another, you quickly realise the cheap option is not always the best. The New South Wales Government knows the feeling well. It has discovered the fleet of inter-city trains it has ordered from South Korea — at the bargain price $2.3 billion — will not fit the tracks in the Blue Mountains, west of Sydney. While the Government denies costs are blowing out, the ABC has learned the first bill from contractor Downer EDI came in at $43 million — that is just for the construction of signalling works and modifications across the rail network. The Government had hoped the trains would prove 25 per cent cheaper than locally made trains. But it must change 20 stations to accommodate the new inter-city fleet, which means cutting away at the platforms and tunnels that are too narrow and too low. The Opposition said platforms at Blue Mountains stations, such as Linden and Warrimoo, are too short for the new trains, which would be up to 205 metres long. Opposition transport spokeswoman Jodi McKay said the Government "needs to be honest about how much this is going to cost". "We know they have forked out $43 million — we want to know what else is to come," Ms McKay said. Last year the NSW Auditor-General warned that the total cost of the project would rise to as much as $3.9 billion. This would take it well above the Government's projected saving of 25 per cent. "They have made a right mess of this," Ms McKay said. "We said from the beginning these trains should have been manufactured in NSW, so they fit the tracks and tunnels and we don't have this excess cost." Transport Minister Andrew Constance said the Government always knew they would need to work on the Blue Mountains line, as the trains were bought to fit the whole network. He does not agree the cost will blow out. "When I said the 25 per cent, that was in relation to the procurement of trains, the manufacturing of the trains," Mr Constance said. "As part of this new inner-city fleet procurement, we're also building a maintenance facility on the Central Coast, which will provide 350 jobs." Existing trains in the state's fleet, such as the Tangara G-sets and Oscars, are suited for several roles. They can run on inner-city lines to underground stations, such as Wynyard, Town Hall and Martin Place, as well as outer-suburban lines to Wollongong, Springwood and Newcastle. The Government said there are six other trains types that cannot get to the Blue Mountains. "We have been to market, we're in a live tender situation at the moment," Mr Constance said. "Once I sign that contract, I will be revealing the final cost." Let's face it, aging infrastructure such as tunnels, signalling and platforms have to be updated one day anyway! It's good that the new trains have prompted this to happen. This "they mucked up with the tunnels" narrative is boring, wrong and a distraction from much more pressing issues - but transport advocacy in Sydney is in the grip of people who are (frankly) numbskulls who focus on trying to destroy the government. FFS if these blue wigged numpties cant outsource properly then they need to have their permissions to do this revoked. But who are we kidding here when dealings with blue team. By outsourcing to overseas manufacturers they then starve the unionists of members.....weakening the union aligned labor party in the process. What they don't realise is it can work both ways. Labor will delight at the stuff ups come election time...promising local jobs as the counter argument. I haven't seen any evidence that contradicts what the government was hoping to achieve. The lineside works are required regardless of where the things are built. At least in NSW that state's Attorney-General conducted an investigation into cost overruns with NSW 'next generation' inter-city trains. Not so with Queensland's NGR trains.